We are engaged in offering Oxidized Starch, which is used in paper industries. These starches are processed using refined starch with controlled conditions of SOP. Oxidation is the only modification, where two different forms of modification a degrading and stabilization take place same as acetylation. Native starches are treated with different oxidizing agents. Highly concentrated oxidized starches are featured by offering low and high viscosity, while boiling and cooling, owing to the high content of dry matter. Peacock Allied Products Private Limited is a well-known name of the market engaged in manufacturing and supplying a superior quality range of Dextrins, Gum Powder, Modified Starches and Adhesives, since 1996. In our range, we offer Thin Boiling Starch Powder, Esterified Starch Powder, Canary Dextrin, Book Binding Adhesive Paste, Paper Case Sealing Gum Powder and Dextrin Adhesive for Paper Tubes and Core. Moreover, we offer Fantastic Flap Gum, Dextrin Adhesive for Fiber Drum, Book Binding Adhesive Gum Powder, Pregelatinized Starch, Envelope Sealing Paste and Multi-Layer Paper Bag Lamination Gum Powder to the customers. These products are widely used to cater to various industrial applications. The range offered by us is made using genuine quality ingredients that are procured from some of the most renowned vendors of the industry. We formulate the products using high quality additives, which helps in enhancing the basic properties of the range offered by us. Moreover, we employ the most modern technology and advanced machinery to produce the range offered by us. Our product range is widely appreciated for its excellent initial tack, low setting & curing time, moisture resistance, high penetration, optimum spreadability & coverage and fungus & bacterial growth resistance. We develop specialized products in order to meet the specific requirements of our customers. 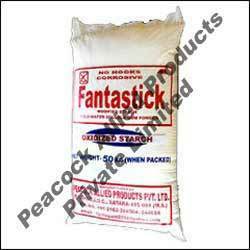 Our range of products is marketed under the brand name of "Fantastic”. The products offered by us are widely used in textile & firework industries, foundries and others. Our client includes some of the names of renowned organizations like Samdhariya Packaging, Shivam Corton, Arundhati and others.